TIGI copyright©olour True Light White + TIGI copyright©olour activator 8.5vol/2.55%. 40g TIGI copyright©olour gloss 6/3 + 10g TIGI copyright©olour creative 5/4 + 75g TIGI copyright©olour activator 8.5vol/2.55%. 20g TIGI copyright©olour gloss 10/02 + 5g TIGI copyright©olour gloss 7/4 + 5g TIGI copyright©olour creative 9/4 + 45g TIGI copyright©olour activator 5vol/1.5%. Take a centre profile parting, finishing at the top crown. Create a curve shaped section, starting from the top crown and finishing at high recession. Repeat the same on the opposite side. Extend the profile parting to finish at the top occipital bone, then create two square shaped sections on either side of the profile. 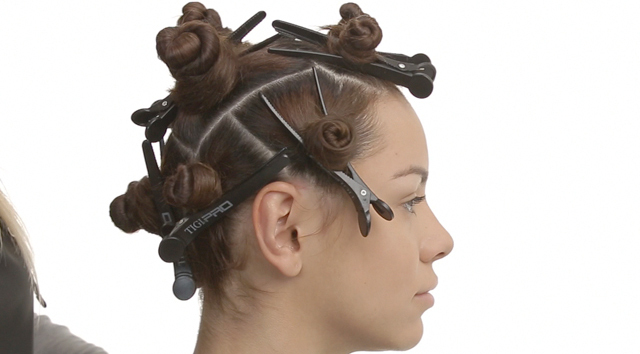 Secure all sections are with TIGI PRO Sectioning clips. From the occipital bone, take two vertical partings finishing at the nape; this creates a rectangular shape. Moving onto the side, take a radial parting, creating two perimeter sections. Repeat the same on the opposite side. 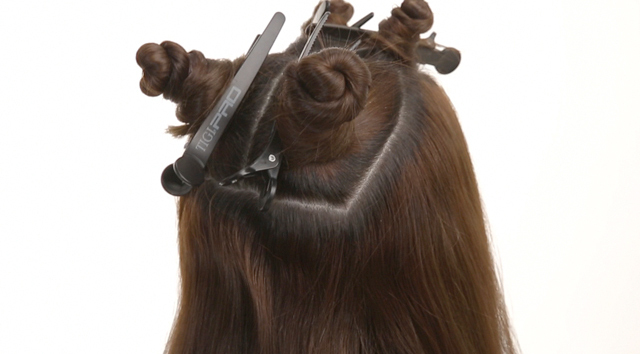 Secure all sections with TIGI PRO Sectioning clips. 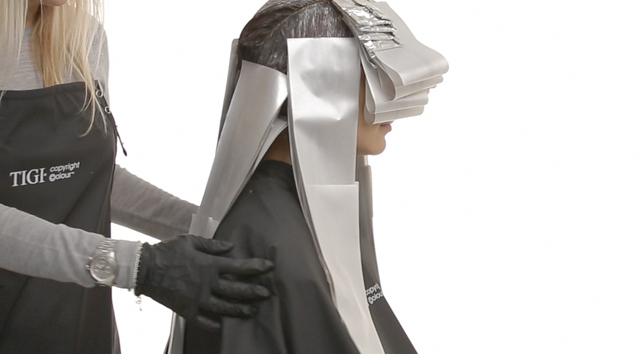 Take horizontal slices from the hairline, work with fine weaves and isolate each slice with foil. Apply Formula 1 from the new growth area through to the lengths and ends. Continue working in the same way until section is complete. Continuing through to the side section, take a slight diagonal slice. Apply Formula 2 on to the first 3 inches of new growth, then apply Formula 1 to the lengths and ends using a blending technique. Continue working in the same way until section is complete. Take horizontal slices through the rectangular section and apply Formula 2 from the new growth area, through to the lengths and ends. Continue working in the same way until the back section is complete. 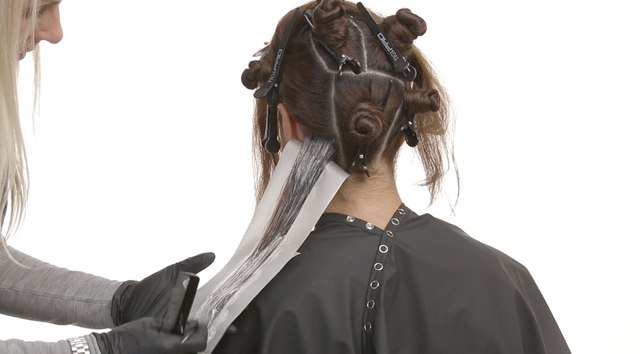 Continue on to the last two inches of the remaining section, then take horizontal slices and apply Formula 2 to the first 3 inches of new growth, applying Formula 1 to the lengths and ends. Repeat the same application technique on the opposite side, then process for 35 minutes. Rinse and remove using S-Factor True Lasting Colour Shampoo and Conditioner. 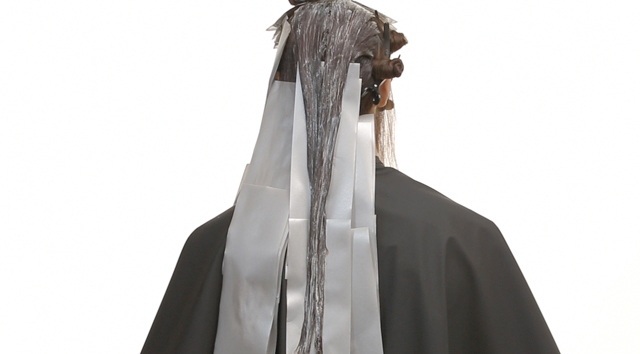 Once removed, tone the pre-lightened sections using Formula 3 Oat Blonde and process visually for up to 20 minutes.